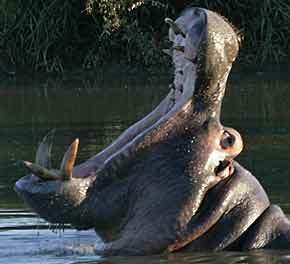 The hippo is a massive animal, with males weighing up to 2,000 kg (4,400 lbs) and females around 1,700 kg (3,740 lbs). Compare that to a 2011 Mini Cooper, which tips the scales at 2,668 lbs! The broad-muzzled head is proportionately large, while the legs are short and stocky in order to support the huge weight. Hippos don't have fur on their coats, instead the skin is smooth and hairless. It's mainly a grayish-black colour, with pink tinges at the skin folds, and around the eyes, ears, and underparts. The tail is short and flattened with a small tuft of black hair at the tip. The hippo's mouth is made up of huge tusk-like canines and incisors. The hippo is a semi-aquatic mammal -- which means it spends much of the day lying in rivers, fresh water pools, or on sandbanks, and then emerges at night to graze on the surrounding land. Hippos usually occur in groups or "pods" of 10 to 15 animals, but larger groups do occur and solitary bulls are not uncommon. Dominant bulls mark their territory by spraying dung. Hippos can sometimes be seen opening their mouths wide, as if yawning, but are in fact showing off their formidable canines to impress and intimidate competitors or intruders (see our blog post, Hippo in Yawning Display, for more). An adult hippo can stay under water for up to six minutes. 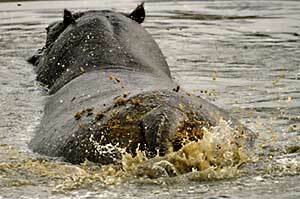 If provoked, startled or cornered, the hippo can be extremely dangerous. Hippos have a reputation for killing more people in Africa than any other wild animal, although this is debatable. (See Hippos - is their Bad Reputation Deserved? for more on this). Hippos mate in the water and a single calf is born, at any time of the year, after a gestation period of 225 to 257 days (about eight months). The hippo mother leaves the other hippos in the pod when it's time to give birth, and then keeps her newborn calf hidden in the reeds. At this point the mother is very aggressive and unpredictable, and inclined to attack if she is disturbed. The hippo is a selective grazer, and can eat up to 130kg (280lb) of green grass in one grazing session. 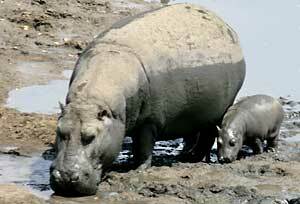 Hippos are herbivores, but have been seen nibbling on carcasses floating in the water. Hippos let out a blast of water after a dive, they grunt and roar during a fight and give a deep roaring grunt, followed by a series of characteristic shorter grunts to advertise that the area is occupied. The roar has been measured to be as loud as 115 decibels! 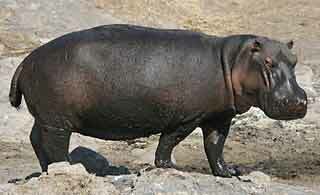 For additional information about the hippopotamus, see our gallery of Hippo Pictures.